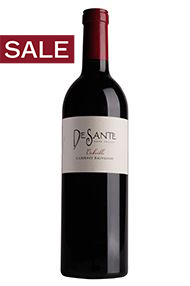 Based in Napa, Katharine and David are the husband and wife team that make up DeSante. 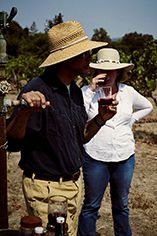 David had dreamed of making wine from a young age, although it was only after a brief stint at medical school – and meeting Katharine – that he followed his dreams, embarking on his studies at UC Davis. 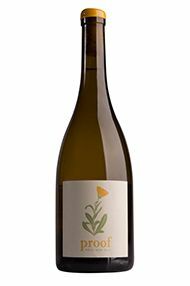 After time spent in Margaret River, Western Australia – Katharine at Pierro and David at the biodynamic Cullen, the couple returned to California, and eventually started their own label in 2001. 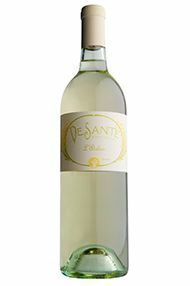 They work with old vines and unusual varieties, as well as more traditional Sauvignon Blanc, Chardonnay and Cabernet. 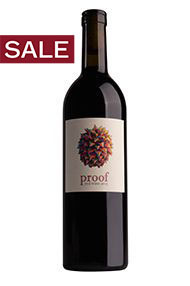 Their top “Proof” red and white take their name from an extraordinary vineyard. 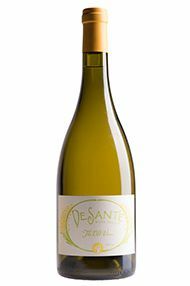 Farmed by two ladies in their 60s, Proof vineyard is surrounded by fruit trees – with its produce primarily going to a local hospital, and until the DeSantes happened upon it, wasn’t used for wine. After grapes have been picked for the hospital, the DeSantes get the pick of what’s left – meaning small volumes and a blend that changes each year. Planted to Green Hungarian, Golden Chasselas, Sauvignon Vert, Alicante Bouschet, Petite Sirah and many other varieties, dry-farmed (the well failed in the 1950s), with the oldest vines dating back to the 1890s – this is Napa, but not as you know it.